More information available at Kodak's website. 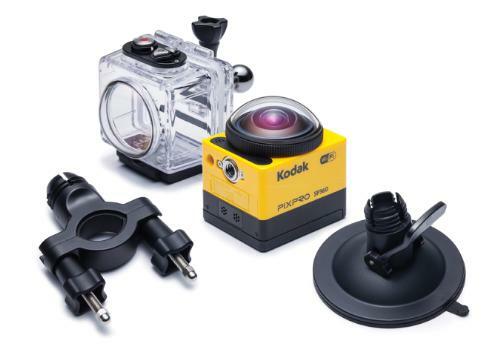 LOS ANGELES, Oct. 28, 2014 /PRNewswire/ -- JK Imaging, Ltd., the worldwide licensee for KODAK PIXPRO Digital Cameras and Devices, announced today its new SP360 Action Cam. This game-changing, innovative and highly portable device is designed to capture stunning 360 degrees HD videos and fully immersive images all in one shot and without the need for multiple cameras and devices. The SP360 Action Cam is small enough to fit in the palm of your hand and sports a unique, dome-shaped fixed lens that captures stunning 360 degrees HD videos (30fps) that can be shot and viewed from multiple vantage points including: 360 degrees Panorama, Front (212 degrees), Split with 180 degrees front and rear views simultaneously, Dome (214 degrees) and Ring/Sphere (360 degrees) modes. Until now, 360 degrees panoramic photography required most users to possess some advanced techniques, specialized equipment, editing software to stitch content together and most importantly, the need for multiple cameras. "The SP360 Action Cam revolutionizes this sometimes cumbersome process and streamlines what really matters, capturing users not only doing what they love, but them engulfed in doing it," said Mike Hackett, executive vice president of JK Imaging, Ltd. The SP360 Action Cam goes beyond just capturing fully immersive 360 degrees HD video and adds a new level of interactivity with free, de-warping app software included for Mac or PC based systems, that allows owners to edit their content post capture. Once the HD video is downloaded from the SP360 to a computer, users have the ability to pan and select a multitude of viewing angles (including: top, left and right) and save them as new video files. Users can also select individual frames from different viewing perspectives in the HD video and save them as hi-resolution still photos for even more creative ways to capture and share their passions and experiences. For even more flexibility, the SP360 is equipped with a motion sensor setting to automatically trigger recording when it detects movement, especially helpful for hands-free activities. The SP360 Action Cam is Wi-Fi® enabled and allows quick connection to a smart phone, smart device or personal computer (iOS™ 6, Android™ 4.0, Mac™ OS X10.9, or Windows™ 8/7 systems or higher) to act as an additional method of remote control or for viewing the content the user is shooting from up to 65 feet away. The SP360 uses the free PIXPRO SP360 iOS or Android-based App available in Apple's iTunes and Google Play stores now. 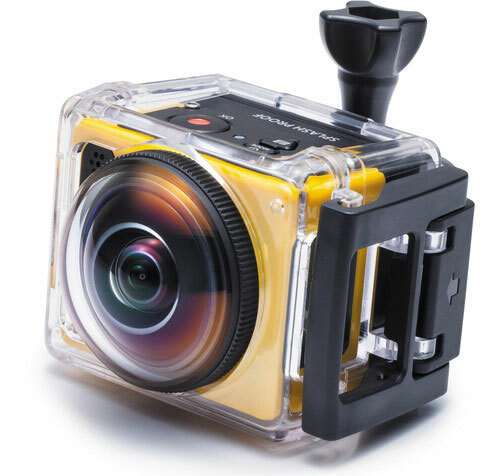 The KODAK PIXPRO SP360 Action Cam is splash proof, freezeproof (-10 degrees c), shockproof (2m), and dustproof. It is compatible with a microSDHC memory card, Class 6 or higher and up to 32GB capacity (memory card sold separately). The SP360 Action Cam comes with: a rechargeable Li-ion battery, battery charger, AC adapter, Micro USB cable, clear plastic lens cover, protective lens cover, carrying case and cleaning cloth. The SP360 weighs only 3.63 ounces (103g) and is sold with 3 different accessory bundles so users can take the action cam on the go depending on their activity or adventures. The Explorer bundle for entry-level (MSRP US$349), the Aqua bundle for watersports (MSRPUS$349) and the Extreme Accessories bundle (MSRP US$399) which includes: bar mount for multiple mounting options such as handle-bars; flat adhesive mount for skate or paddle board; curved adhesive mount head strap; helmet mounts; surfboard adhesive mount; suction cup mount; extended arms; quick clip; tethers; clear standard mount housing and clear waterproof housing. This entry was posted in JK Imaging, Kodak. Bookmark the permalink. Trackbacks are closed, but you can post a comment.